10% off Spring Breaks quoting "Visit Devon 2019"
Cuckoo Down Farm glamping in Devon is tucked away in beautiful countryside near the World Heritage coastline at Sidmouth and its beautiful, safe beaches. Enjoy a relaxing holiday in this stunning location. We have four beautifully decorated safari lodges and two gorgeous yurts, all providing relaxed and easy glamping and designed with couples and families in mind. 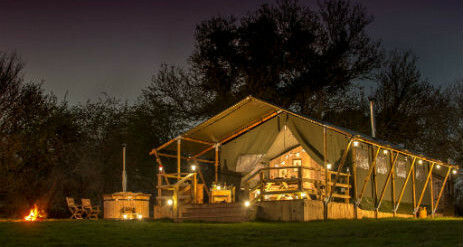 Our latest addition, Blackberry safari tent, also comes with a wood-fired hot tub. This farm is dog friendly and we welcome dogs to stay. Experience all the fun of the farm including ponies, chickens, bluebell woods, campfires and 30 acres of unspoilt meadow. 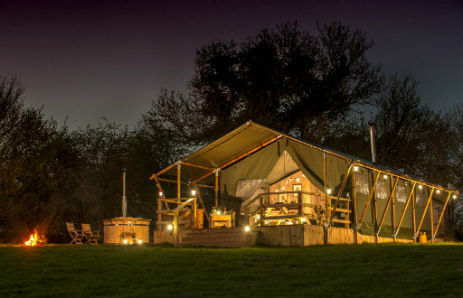 With four safari tents and two yurts to choose from, each has its own compost loo, kitchen, standpipe of drinking water, campfire and wood burning stove. Safari tents also have their own bathrooms with hot showers. All have wooden floors and are furnished to a clean, attractive and comfortable standard, checked regularly. 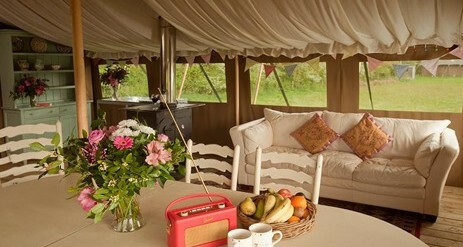 Our glamping tents are all in the same six acre meadow, spaced at about 30-40 yards apart from each other. 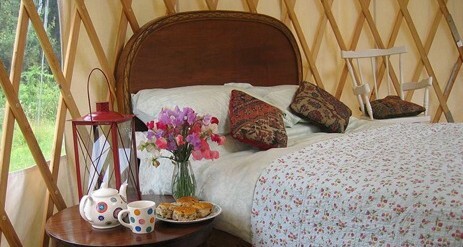 Our two yurts, Clover and Buttercup, are 18ft diameter and each have a double bed and two double sofa beds, as well as coffee table and storage chests. They each have a woodburning stove to keep them warm. 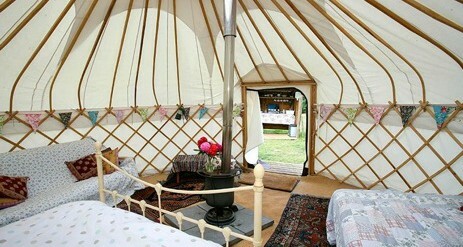 Our yurts can accommodate four people or up to six for a family with children. We can provide travel cots and high chairs free of charge. 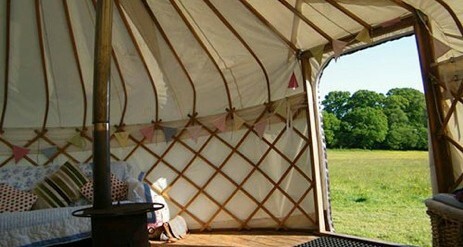 All our yurts, Clover, Bluebell and Buttercup are very similar and of the same standard. Our safari tents have their own private bathrooms within the tent, with hot showers. For the yurts, the showers are in the barn a short walk from the camping area. They are open 24/7, have constantly hot water and are regularly checked and cleaned. We have fridges, freezer, a washing machine and tumble dryer in the barn, all free to use, plus power points for charging phones etc. Children can play in the woods, dam the stream and build dens. There’s space for cricket, rounders, football, bike-riding and tree-climbing. They’ll love to meet Ebony, our Dartmoor pony. We also run regular Forest School sessions in our three-acre oak and bluebell wood, with everything from outdoor cooking to den building on offer. You can borrow a travel cot and/or high chair free of charge, subject to availability. Please book in advance. We also provide free toyboxes – let us know whether you want one for under-threes or over-threes. Kara, our qualified yoga teacher, can offer “Yogini” classes – children’s magical yoga adventures in your glamping tent or outside on the grass. This is a great way to ensure you have relaxed, chilled-out children. Please book well in advance. There is a shallow stream on site and a pond (well-fenced and gated) 500 yards away, please do keep an eye on your children. Please also check the safety information in our Terms and Conditions. Wellies, torches, warm clothes and wet weather clothes. Bring extra rugs and blankets in case it is chilly, and hot water bottles. There is so much to do in East Devon (and the wider South West of England) we almost don’t know where to start! Choose from country walks, lovely gastropubs, World Heritage Coastline, safe beaches, sea fishing, stately homes, play areas, top-notch restaurants, children’s play attractions, shopping and so much more. 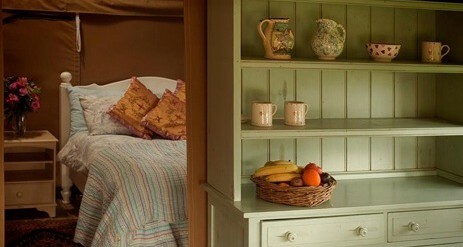 Exploring oak woods, kids’ pony rides or simply chilling out – Cuckoo Down Farm is the place to be! Trust properties, South West England is one of the most beautiful, friendly and fascinating places you could hope to visit.